Born Again Pews’ recent appearance in Tulsa World has sparked a storm of activity for our business and we’re happy that the Lord has continued to bless our business. 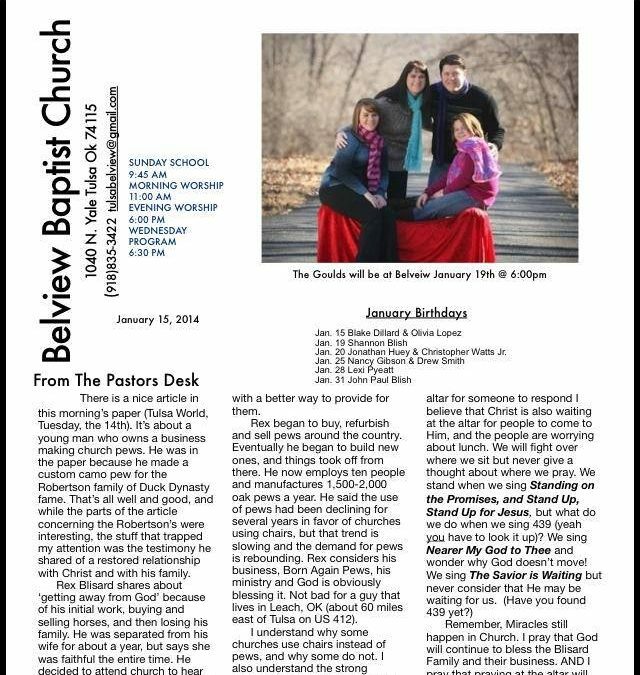 We were recently sent a letter from Tom Branch, the pastor of Belview Baptist Church in Tulsa, Oklahoma. 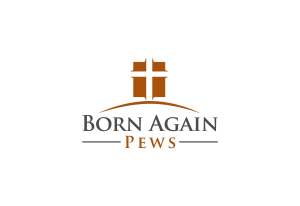 In his newsletter for the day after the article appeared in the paper, Tom wrote about Born Again Pews and how Rex’s life is dedicated to the Lord. There is a nice article in this morning’s paper (Tulsa World, Tuesday the 14th). It’s about a young man who owns a business making church pews. He was in the paper because he made a custom camo pew for the Robertson family of Duck Dynasty fame. That’s all well and good, and while the parts of the article concerning the Robertsons were interesting, the stuff that trapped my attention was the testimony he shared of a restored relationship with Christ and with his family. Rex Blisard shares about “getting away from God” because of his initial work, buying and selling horses, and then losing his family. He was separated from his wife for about a year, but says she was faithful the entire time. He decided to attend church to hear his daughter sing, and something happened there that changed his mind about his marriage. He told his wife, “I’m ready to make this thing work.” He moved back home and got a job teaching shop. When he lost that job he dug ditches. AMEN. His family is back together and God provided him with a better way to provide for them. Rex began to buy, refurbish, and sell pews around the country. Eventually he began to build new ones, and things took off from there. He now employes ten people and manufactures 1,500-2,000 oak pews a year. He said the use of pews had been declining for several years in favor of churches using chairs, but that trend is slowing and demand for pews is rebounding. Rex considers his business, Born Again Pews, his ministry and God is obviously blessing it. Not bad for a guy who lives in Leach, OK (about 60 miles east of Tulsa on US 412). We want to thank Brother Tom for his kind words and sharing Rex’s testimony with his church. The Lord has blessed our family with a successful church pew business and we see every day as an opportunity to give back that blessing ten-fold by helping churches save money on church furniture to they can spend more money on spreading the Word. If you’re in need of church furniture, be sure to give us a call.